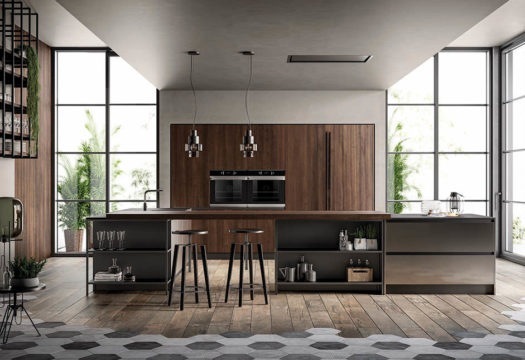 Kalì creates fluid, functional spaces in line with modern needs. 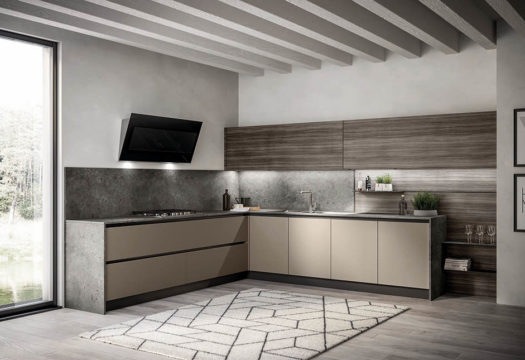 The islands and peninsulas bring out the distinctive traits of the Arredo3 collection, bringing a dynamic lifestyle into the kitchen. 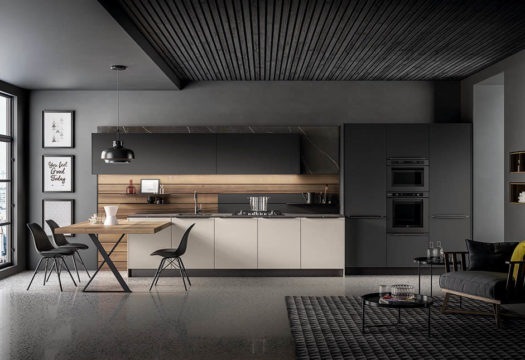 The open modules are inserted in the compositions to make them even more functional and to lighten up the geometric design of solids with open spaces. 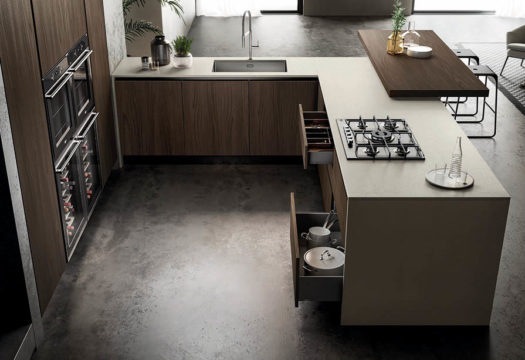 The Factory compartments can be placed in line with the hanging cabinets or juxtaposed with the bases that support snack counters, offering easy access to stored objects. 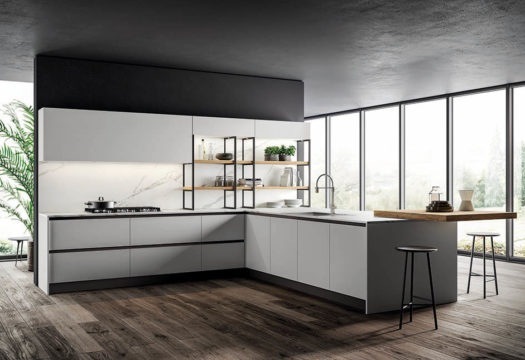 The Air shelves add rhythm to the Open wall-mounted backs, between the worktop and the hanging cabinets, or beside the base cabinets, making the kitchen shift towards the living area. 10 nuances rely on the natural hues of wood and stone, including American walnut laminate, stone-finish brushed PET or chrome resin. The stainless steel finish with its slight reflections adds a particular effect to the compositions. 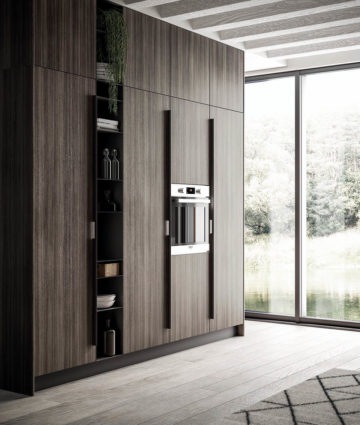 Two new built-in handles, Profilo and Riga, have been added to the groove handles with a 30-degree section, expanding the range of choices; the first is placed flush with the door along its entire thickness, while the second has a protruding grip. 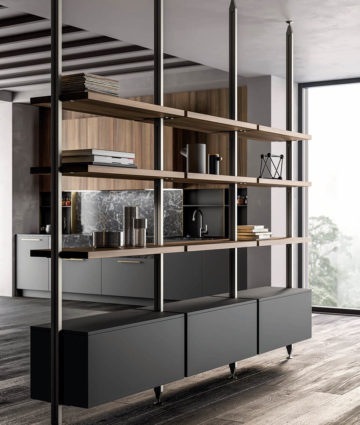 Another new feature is the Free bookcase, composed of aluminium uprights on which to place shelves and base modules.